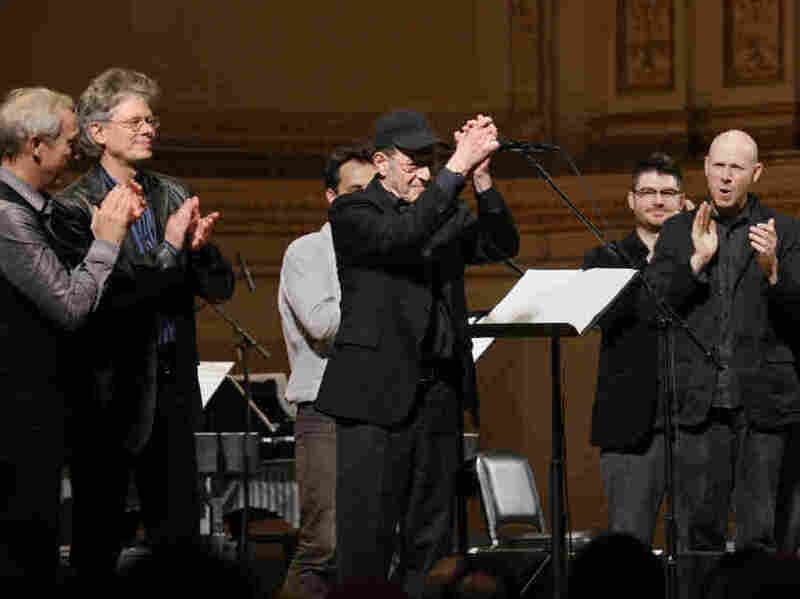 Steve Reich At (Nearly) 75 : Deceptive Cadence In his most recent works, the composer reveals fresh insights into the business of being human — nearly three-quarters of a century after his birth. Steve Reich takes a bow at his 75th birthday concert at Carnegie Hall alongside members of the Kronos Quartet and So Percussion. This October, composer Steve Reich is turning 75 — an age that for many other artists, especially ones as widely adored as Reich, wouldn't be marked by much more than a few valedictory laps. Instead, he continues to make innovative music and is still one of the most important and influential voices of our era. That fact became vivid reality this past Saturday evening at Carnegie Hall, when Reich was feted with a concert that was not at all a retrospective. Instead, it was comprised entirely of works Reich has written only within the last four years, performed by artists who have become Reich colleagues as well as fans: the Kronos Quartet, longstanding partners of Reich, all the way back to 1988's Different Trains; the downtown denizens of Bang on a Can; So Percussion; and the sextet eighth blackbird. As much as any other contemporary composer, Reich has become an icon to mainstream music fans and musicians like Thurston Moore or Sufjan Stevens. At the same time, though, a number of audience members stalked out of Carnegie angrily mid-concert. Here's a composer who still wields the power to infuriate some, just as he did when his Four Organs was booed at Boston's Symphony Hall 40 years ago. Idol though Reich is, however, his music of the past few years has posed more questions than answers — and maybe that's exactly what makes his voice so relevant in our own age of anxiety. So Percussion plays Reich's Mallet Quartet. But the acoustics of Carnegie Hall revealed other qualities in this piece entirely. The slow middle section — a meditation on space and stillness — offers a real contrast to the kineticism of so much else of Reich's work. The warm, low woods of the marimbas played in canon against the ringing of the vibes, which in the resonance of Carnegie's Isaac Stern Auditorium pealed as brightly as church bells. WTC 9/11: A piece that Reich calls addressing "unfinished business" — the business, perhaps, of being human, of struggling mightily through personal and communal loss. Unlike, say, John Adams' On the Transmigration of Souls — a piece written in the year following 9/11, and which movingly memorializes the astonishing toll of lives lost and lives shattered — Reich's WTC 9/11 distills the existential issues of the past decade: What is to come now? Reich's piece crystallizes some of the anxiety and searching that characterized not just the chaos and pain of the attack and its immediate aftermath, but the great unknowns that have characterized the last decade for all of us, last night's Osama bin Laden news notwithstanding. In WTC 9/11, Reich returns to a form that he has long used so effectively in such pieces as It's Gonna Rain and Different Train, blending recorded and manipulated speech with music. One of the most effective instants of Reich's textual interlaying of spoken word and music comes in the moment we hear a man, recorded eight years after 9/11, recounting the day. His voice strained and tight with emotion, he says, "It was chaos," against frantic, harrowing close intervals played by the strings rubbing up against each other. We can hear the anxiety in the man's voice as he relives that terrible day; the experience is still so close and real — both to him, and to us. Reich opens up a second meaning of the initials "WTC," as the World to Come. He draws in the voices of some of those who attended to the Jewish obligation of shmira in the days after 9/11: sitting near the bodies of victims before their burial, reciting and singing Psalms and other Biblical passages ceaselessly. In Reich's treatment, shmira is almost is an act of willing a new reality into being, though none of us is sure what actually is to be: "The world to come," as one of Reich's interviewees muses, "I don't really know what that means." The second half of the concert opened up another channel of Reich's output, one that again belies any hoary Grand Elder Statesman aura. The piece 2X5 places two quintets of electric bass, piano, drums, and two electric guitars against each other; its world premiere in 2008 fixed Kraftwerk up with some of the Bang on a Can musicians. There's often a lot of talk about how Reich marries classical paradigms to pop and rock aesthetics. Some of that crossover is quite real — one of the musicians playing in this performance of 2X5 was Bryce Dressner from The National, and another was Mark Stewart, who on other nights directs Paul Simon's band; a third was Glenn Kotche of Wilco. In pieces like 2X5, however, you hear Reich using the musculature of the electric guitar in a very different context than most rock or pop artists. It's in the service of techniques like hocketing, the "hiccuping" effect of instruments trading playing and silence to create one bigger musical line. The result is ten musicians bobbing up and down and swaying together that might, in high-handed terms, be called a joyous communion; in simpler terms, it's ten artists just totally rocking out. 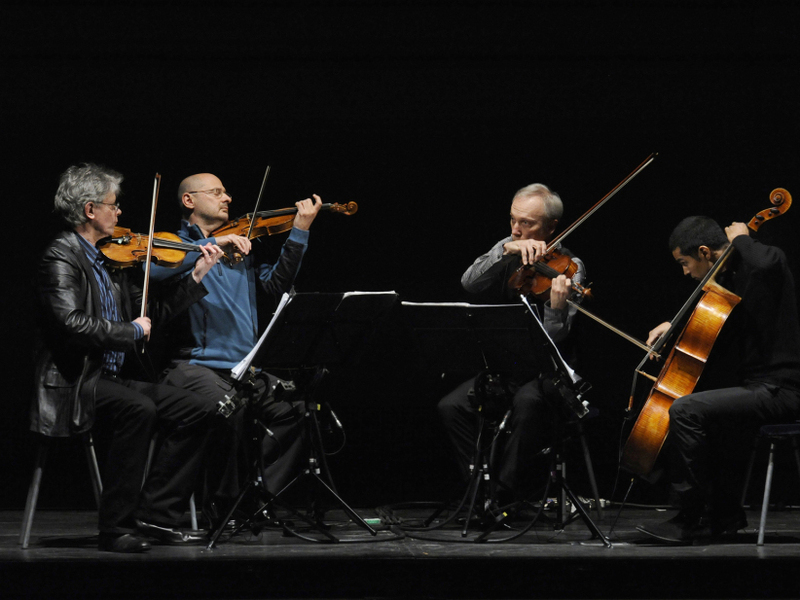 The Carnegie Hall concert ended with Reich's Double Sextet, which earned the composer a Pulitzer Prize in 2009. Written in 2007 for eighth blackbird (who originally played against a recordings of themselves, but here faced Bang on a Can musicians), Double Sextet is a tightly coiled thing that positively vibrates with an inner energy, yet has lyricism at its core, and a sense of space and line thanks to harmonies that constantly shift and are reshuffled within a larger form. Such lacunae and harmonic movements are rather new in Reich's music, but that's such a large part of the pleasure of his recent work, the restless search of exploring new ground.